CAPACITY AVAILABLE FROM 150 LITERS TO 1500 LITERS. 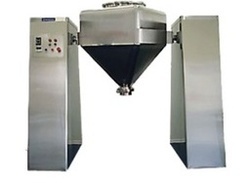 The Bin Blender is an efficient and versatile machine for mixing dry powder and granules homogeneously. The unique baffle fitted on the lid ensures uniform mixing. This blender is ideally used for hormones products in pharmaceutical industry, Food, Chemical and Cosmetic products etc. Sensor checking lock system before machine start. Safety Bar to cover moving part. Rotation of tank in vertical. Variable Speed of rotation by VFD. Timer to adjust batch time.